For a more traditional alternative, we highly recommend staying at a Japanese inn (ryokan) for one or two nights during your tour. This experience is one far-removed from Western-style hotels. In a ryokan you will be looked after from the moment you are greeted at the entrance in a more intimate fashion, receiving the highest levels of service and delighting in the best local food available. Whether you stay in a modern ryokan-hotel, or a traditional ryokan, all rooms are Japanese-style, and a traditional dinner and breakfast is usually included. In general, we arrange for properties with private en-suite facilities. However, some more rural ryokans or temple lodgings may have shared bathroom facilities. Surrounded by nature and spectacular views, this hotel has both Western and Japanese-style rooms. This stunning seaside Japanese hotel has both Western and Japanese rooms/suites. There are a variety of facilities onsite and a short walk to the beach and sand spas. The Ryokan Hotel is located in the centre of the pleasant onsen town just a 5-minute walk from the train station. Guests are able to experience the variety of onsen available both within the hotel, and around the town as well as enjoying local cuisine. This ryokan is conveniently just 7 minutes by bus from Hakone Yumoto station, with both indoor and outdoor hot spring baths for guests to enjoy. A traditional Japanese ryokan set among beautiful surroundings on a hill, where guests can enjoy the views from both their room and onsen baths. Senkyoro offers family baths (which can be privately reserved), and pottery classes. This luxurious ryokan in the beautiful Hakone National Park offers elegant meals and each room has a private outdoor wooden bath. A luxury ryokan located at the most popular area in Hakone surrounded by beautiful natural landscapes. Relax in comfortable open-air hot spring baths in each room and experience the beauty and traditional hospitality that will make your stay unforgettable. Transported to a different world once you arrive at Hakone Ginyu , this modern ryokan has spectacular mountain views from all guest rooms. All rooms have private outdoor hot spring baths on the terrace. Located in the centre of Izu-Hakone area, this ryokan is known for its traditional architecture, art and history. With a wide selection of hot springs baths, this ryokan has a teahouse set in an orchard of 3,000 plum trees from where you can get a wonderful view of Mount Fuji. This ryokan can be a great hideaway for honeymooners. This minshuku accommodation provides a comfortable stay in this historical town. There is a same-gender communal bathing area available 24 hours a day, and seasonal homemade cuisine is served throughout the year. This ryokan is 7 minutes on foot from JR Takayama station in the centre of Takayama and within an easy walk to nearby tourist sights. All rooms have a private bathroom and there is also male and female hot spring baths. This ryokan offers a comfortable and spacious area with a few connecting rooms. A few unique baths are available which are constructed entirely out of cypress. This traditional ryokan is located upon a hill overlooking Takayama, just minutes from the tourist area. All rooms are air-conditioned with a private bathroom. Located in central Kyoto. Easy access to the temples and shrines. 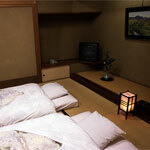 This is a traditional ryokan with modern amenities has both rooms with private bath and without. This fine artistic wooden structure is located in the very centre of Kyoto. There is a traditional Japanese style garden and refined Japanese cuisine will be served in each room. Located in the city centre, this is one of the finest ryokan in Kyoto. It has 33 Japanese style rooms with air-conditioning, private bath and most with garden views. The ryokan offers first-class quality Kyoto-style kaiseki cuisine on fine handcraft ceramics and lacquer ware. A small temple located off the main road between the visitor centre and Okunoin cemetery. This Buddhist temple lodging offers an insight in the life of Buddhist monks, including eating vegetarian meals (shojin ryori). A 15-minute ride from the Koya-san cable train station, guests can experience staying in a historical Buddhist temple. 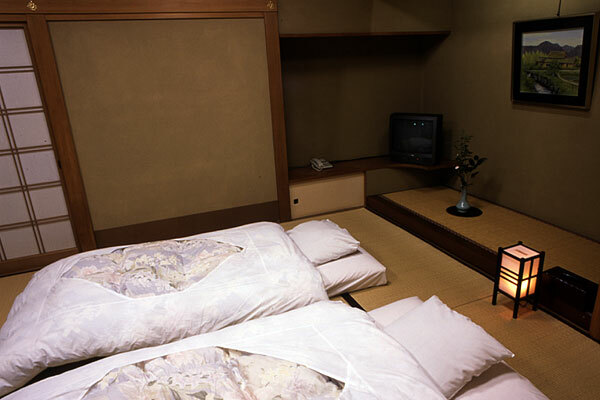 All rooms feature tatami floors and Japanese futon bedding. There are a few-en suites are available. This shukubo has a beautiful traditional garden. A prayer and meditation area is available. A traditional ryokan which dates back to the end of Meiji era. There are 28 Japanese-style rooms and you can dine on some of the finest cuisine in Kurashiki. An excellent family-owned hotel with 50 rooms (Japanese and Western). This ryokan is just a 5-minute walk from the Miyajima ferry pier. Guests can enjoy views over the island and ocean from their rooms and delicious seasonal seafood and meat all locally sourced. A 7-minute walk from the Miyajima pier, this ryokan is located near Itsukushima Shrine on Miyajima Island, and is one of the few lodgings on the island with hot spring baths. The landmark Torii gate can be seen from the guest rooms on the sea-side. The first and finest Ryokan in Miyajima, Iwaso provides elegant, traditional accommodation. This historic ryokan is located in Momijidani Park, where the changing autumn colours are best seen. This hotel is located within walking distance from Dogo tram terminal and has 100 Japanese-style guest rooms with air conditioning two hot spring baths and sauna. A 5-minute drive from Matsushima station or Matsushima Kaigan station. 43 guest rooms with air-conditioning, 3 lounges, 2 restaurants and 1 bar. Situated in the centre of Beppu, which is one of the biggest onsen (hot spring) towns, all rooms have a view of Beppu Bay. Furthermore, you can enjoy the sea view from an outdoor public bath situated at the top of the hotel. This stunning seaside Japanese hotel has both Western and Japanese rooms/suites. There are a variety of facilities onsite and it is a short walk to the beach and sand spas. This ryokan has 15 Japanese-style rooms. Some guest rooms have their own private hot spring bath. Pick-up service from Kurokawa Onsen bus stop is available. One of the most traditional ryokans in Unzen, having recently celebrated its centenary. The hotel has both indoor and outdoor public baths. A traditional Japanese Inn, located on the hill of Yufuin, Oita. This is a boutique ryokan with just 10 guest rooms where you can enjoy the beautiful nature of Yufuin. Comfortable rooms with some private open air hot spring baths. Within easy access to many local attractions, it is an ideal place for a quiet getaway. Located in central Yufuin with panoramic views from the hot spring baths. The ryokan offers a selection of Japanese and Western rooms. An ideal ryokan hotel for families. Japanese-style inn built in the style of a tea ceremony house and quietly nestled at the foot of Mount Yufuin. Japanese-style rooms will provide a relaxing and quiet stay. The ryokan is a 5-minute taxi ride from JR Yufuin station.